This guide provides search strategies and recommended resources for research in English 110 with James Brausch. Your research assignment requires you to choose an arguable topic on a debatable issue and write a 7+ page essay making a strong case for a specific argument or point, using at least 8 sources. At least 4 of your sources must be from books, periodicals, or reference sources found through a library. You may interview a professor as one of your other sources. In addition to the final essay, you will complete a Formal Outline and and Annotated Bibliography. 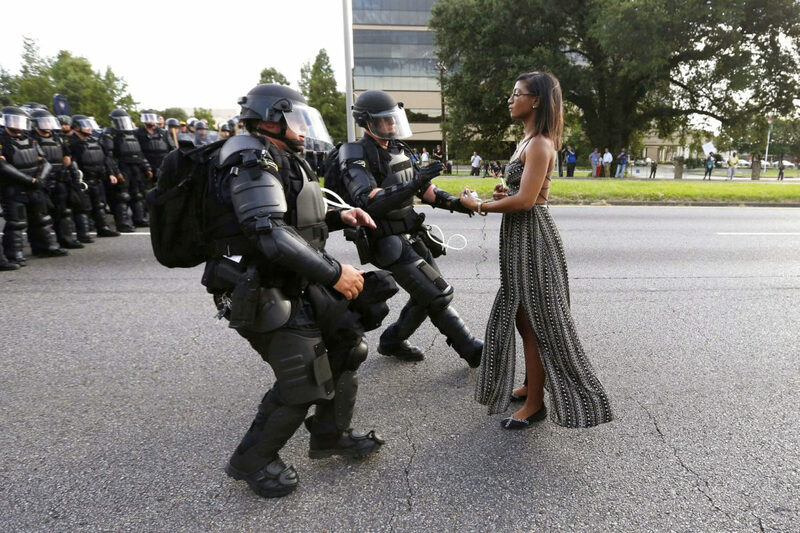 Image: "Lone activist Ieshia Evans stands her ground while offering her hands for arrest as she is charged by riot police during a protest against police brutality outside the Baton Rouge Police Department in Louisiana, USA, 9 July 2016. A new study found militarized police units are used more often in communities of color. Photo by REUTERS/Jonathan Bachman," from PBS News Hour.